Galena crowned Dante Bradley-Stewart and Kinsey Stephens as Homecoming King and Queen, respectively, on Friday, December 15. Photo courtesy of White Dove Photography. On Friday, December 15, Galena High School hosted its annual Winter Homecoming. The theme for the week was “Timehop” and the students decorated the school to represent various decades from the 20th and 21st centuries. Each class participated in the annual Homecoming Hallway Decorating contest of which the Senior Class emerged as the winners with the Sophomores earning the title of runner-up. 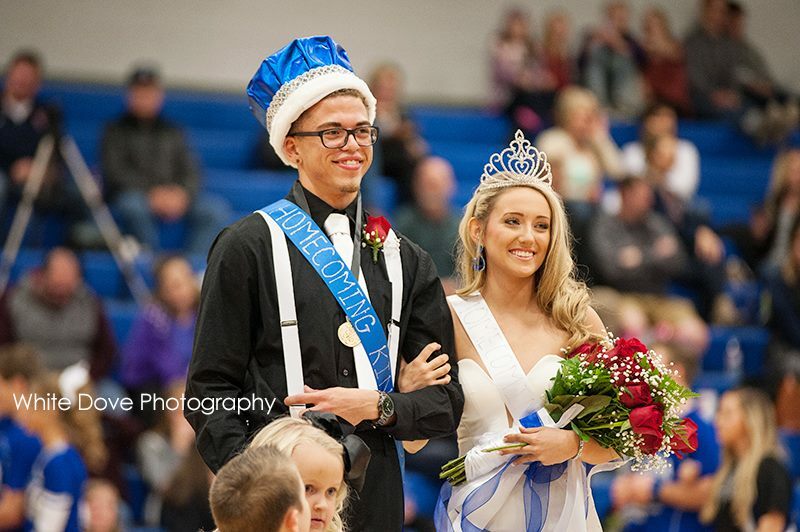 The annual Homecoming King and Queen coronation took place that evening before the Varsity Boys’ Basketball game versus the School of the Ozarks. The senior candidates for Homecoming King were Dante Bradley-Stewart, Austin Holt, and Jacob O-Neil. The senior candidates for Homecoming Queen were Kinsey Stephens, Mary Yocum, and Megan Caulfield. The Homecoming Court was completed with juniors Destany Cloud and Caleb McCullough, sophomores Becca Baker and Caleb Clark, and freshmen Hailey Eutsler and Caden Sartin. The Court was escorted by 8th grade attendants Savanna Baker and Noah Gulick along with 7th grade attendants Kalie Burchett and Robert Carter. The flower girl and crown bearer for the evening were 4 year-old Lily Lais and 4 year-old Bobby Taylor. On hand to present the crowns for the new King and Queen were Ashlee Greenway and Caleb Hall. Greenway was last year’s Homecoming Queen and Hall is a 2017 graduate of Galena. Hall was presenting the crown in place of last year’s Homecoming King, Caleb Seaman, who was away completing his training for the U.S. Army. ​The 2017-2018 Homecoming King is Mr. Dante Bradley-Stewart and the 2017-2018 Homecoming Queen is Miss Kinsey Stephens.